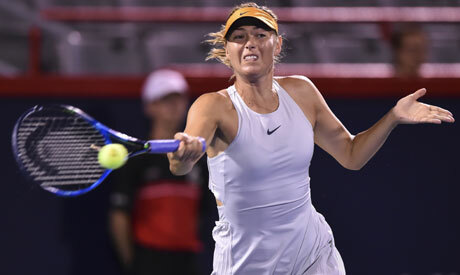 Maria Sharapova fired 25 winners past hapless Russian compatriot Daria Kasatkina in a 6-0, 6-2 victory at the rain-hit Montreal WTA event on Wednesday, but Angelique Kerber's first match since capturing the Wimbledon title ended in a sobering defeat. Sharapova needed just 66 minutes to see off 12th-seeded Kasatkina in an impressive and timely display of big-hitting, with the US Open getting underway in just under three weeks' time. Play was suspended before the start of Wednesday's night matches because of rain, resulting in four contests being added to Thursday's schedule. The action will resume at 11:00 am local time (1500 GMT). World number one Simona Halep will now play Anastasia Pavlyuchenkova in the second match on court central followed by second seeded Caroline Wozniacki in her second round match against Aryna Sabalenka of Belarus. Venus Williams also had her second match of the tournament moved to Thursday. She beat world number 124 Caroline Dolehide in the first round but will have a tougher test against veteran Sorana Cirstea of Romania. "Very tough to see players getting injured that badly on court. I wish Miki Buzarnescu a veryyyy speedy recovery! Stay strong!," tweeted Svitolina.